The city of Nexus was built around a well of magical power hidden deep below the earth. The discovery of the Ether Well made Nexus soar to incredible wealth and power. Wandering tribes flocked to the city to worship and learn from the mysterious magic beneath it. As Nexus grew, more and more power was drawn from the well, and as more power was gained, the more unstable the energies of the well became. After millennia of providing Nexus with knowledge and might, the well gave the city something new...Blight. The Blight destroyed the city and corrupted its citizens into monstrous fiends and demons. The once great city fell into darkness and was forgotten, its wealth and power were only remembered as myths. Now the city is rediscovered, drawing heroes and adventurers from across the world. 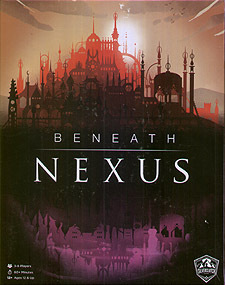 It is up to you to discover what secrets lie...Beneath Nexus. Discover powerful treasures and unlock forgotten secrets in your quest to reclaim the city of Nexus. The Heroes combine their unique skills and powers to overcome the trials of The Blight Lord who uses fiendish monsters and dark magic to destroy all who delve Beneath Nexus.